A key question that news organizations face, particularly during intense periods like election years, is to what degree journalists should present the facts with some interpretation…. 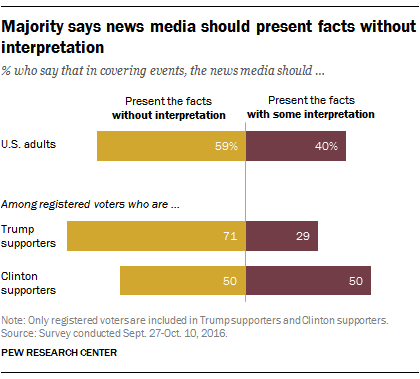 A majority of U.S. adults (59%) reject the idea of adding interpretation, saying that the news media should present the facts alone, a recent Pew Research Center survey found. The survey was conducted Sept. 27-Oct. 10, before Election Day. Registered voters who supported Trump for president favored a “just the facts” approach by more than two-to-one, with only 29% saying the news media should add interpretation. Clinton supporters, on the other hand, are evenly split on the issue, with half against interpretation and half favoring it. This may be linked to a perception among Republicans that coverage of their candidate had been too tough. Among Republicans, 46% thought coverage of Trump had been too tough, while only three-in-ten Democrats thought the same of coverage of Clinton, according to Pew Research Center’s mid-September survey. 1. Are you surprised by the Pew Poll results that show the majority of Americans believe the news media should present the facts alone, without interpretation? Explain your answer. 3. a) What is your opinion: Should the media include interpretation in their news reports? Why or why not? 4. There are substantial partisan differences over whether journalists should include interpretation in their stories. Trump supporters mostly say just the facts; Clinton supporters are split – half against interpretation and half for it. If true, why do you think this is so?